Today Voyenno-promyshlennyy kuryer published what it says is the nearly complete version of new military pay and pension rates that will be reviewed by the Defense Ministry and other power ministries by 20 May, and passed on to the Duma not later than 22 June for approval. There might, says VPK, be some changes and amendments as parliaments are want to make. But expect the package to become law by early July at the latest. The new pay rates will be implemented for the Defense Ministry, as long promised, on 1 January 2012, and a year later for other power ministries. In the following graphic, VPK shows duty and rank pay for some military men. This is just a foretaste of the data presented. Of course, duty pay is the more significant component. It’s why some officers outside the TO&E, i.e. without duties, are hurting so badly — they don’t get this big chunk of pay. 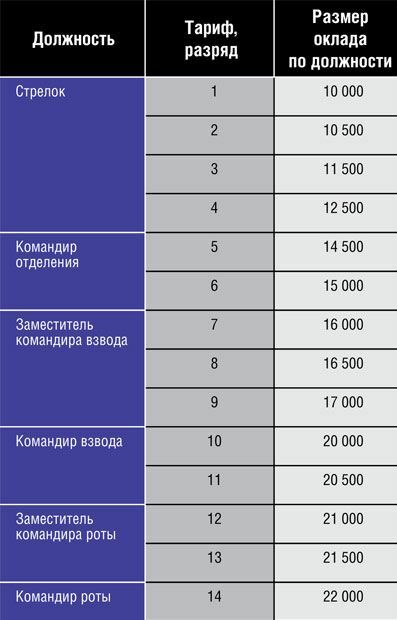 But what it says is a sergeant who’s the upper grade of two for section commander gets 6,500 rubles for his rank and 15,000 rubles for his duty or position pay, or 21,500 rubles per month. But let’s call this “base” pay onto which other supplements are added. A general-colonel serving as a deputy defense minister would get 64,000 rubles in “base” pay per month. Supplements and coefficients are calculated for years served, class qualifications, work with state secrets, service under special [usually climatological] conditions, etc. The following graphic shows part of the list. It actually runs up to nine different supplements and coefficients. Supplements are sometimes calculated on duty pay; other times on combined duty and rank pay. Let’s say our section commander sergeant has served 10 years, has a second class qualification, works with secret information, and serves with Russian troops in Tajikistan — he would add 4,300 and 2,150 and 1,500 and perhaps 15,000 to that “base” of 21,500. His supplemented pay becomes 44,450 rubles per month — not bad, but this would likely be an exceptional case we’ve made just for illustration purposes. 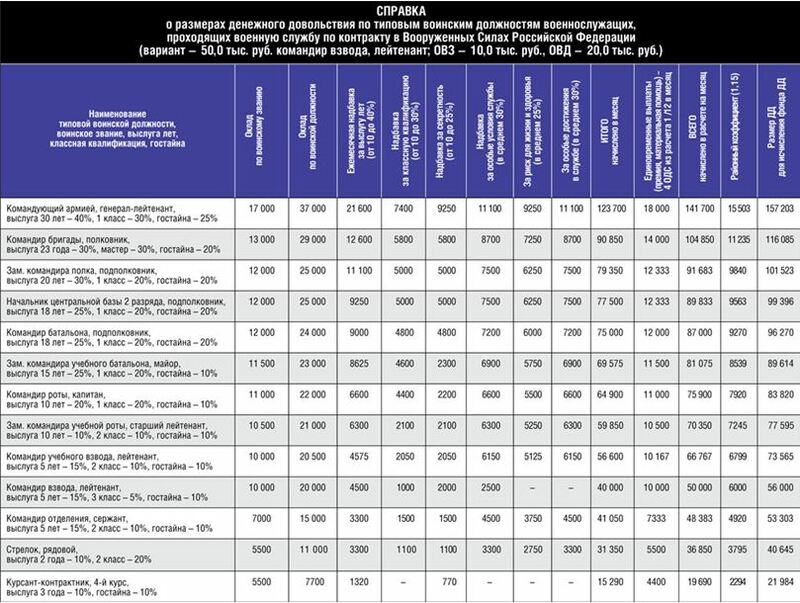 Note that items 6 and 7 on the supplement chart are Defense Minister Serdyukov’s “premium” pay supplements for outstanding performance. They allow officers to double their duty pay or even triple their combined duty and rank pay. “Premium” pay was a stopgap to raise military salaries until a new, higher pay system could be devised. But VPK makes it look like this will become a permanent feature of the new system. The draft law sets out lots of other special payments and benefits to servicemen for this and that, relocation, death, injury, dismissal, etc. The following graphic provides some examples of what officers and soldiers will make. This shows the kind of lieutenant platoon commander that Medvedev, Putin, and Serdyukov have described earning over 50,000 rubles per month. And our putative section commander sergeant . . . it lists him at about what we estimated 41,000 rubles or so, plus other supplements that take him over 50,000 too. There’s an exemplar pension chart for those that are interested, and below is a snip of the 50-grade schedule the military uses. If you view the entire chart, grade 50 is for a first deputy minister, there are two grades for MD commanders, and seven different ones for deputy army commanders, so on and so forth. What’s it all mean? Again, this pay reform is a thing both necessary and long in coming. It’s also going to be very expensive at a time when there’ll be lots of other outlays for the GPV, for contract enlisted, for military housing, for better military infrastructure, etc. It won’t be easy. But it seems to be a priority. The difficulty is that it’s very hard to move forward on all military reform fronts at once. We’ll have to watch to see which areas are treated with preference or, alternatively, neglected. This entry was posted in Manpower, Officer Corps, Serdyukov's Reforms and tagged Pay, Personnel. Bookmark the permalink.